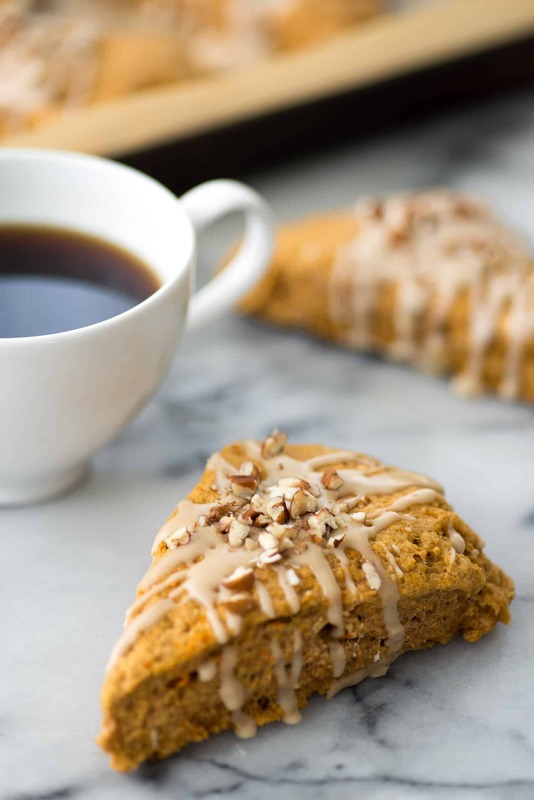 Sweet Potato Pecan Scones with Maple Glaze! 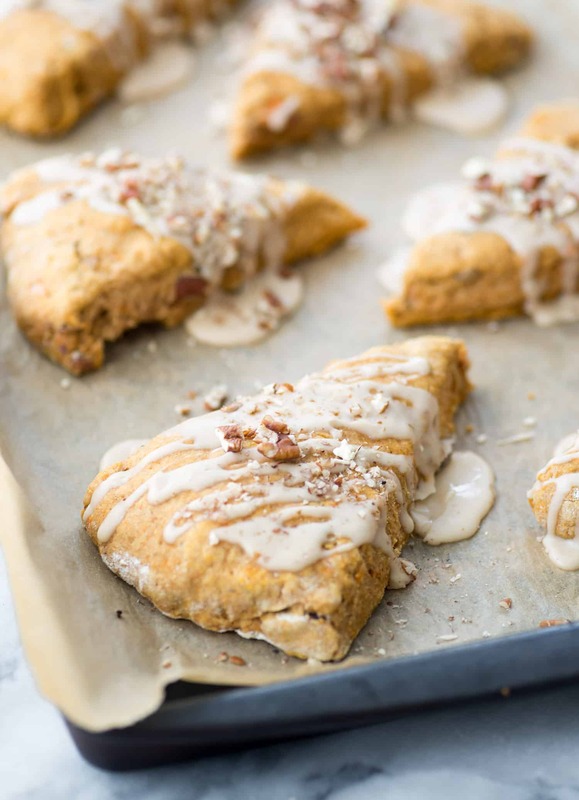 You are going to love these healthy, vegan scones! Packed with sweet potato puree, whole wheat-flour and pecans. Drizzled with maple frosting and covered with more pecans. This post is sponsored by Folgers. I only partner with brands I use and enjoy, thanks for supporting the brands that make DK possible. 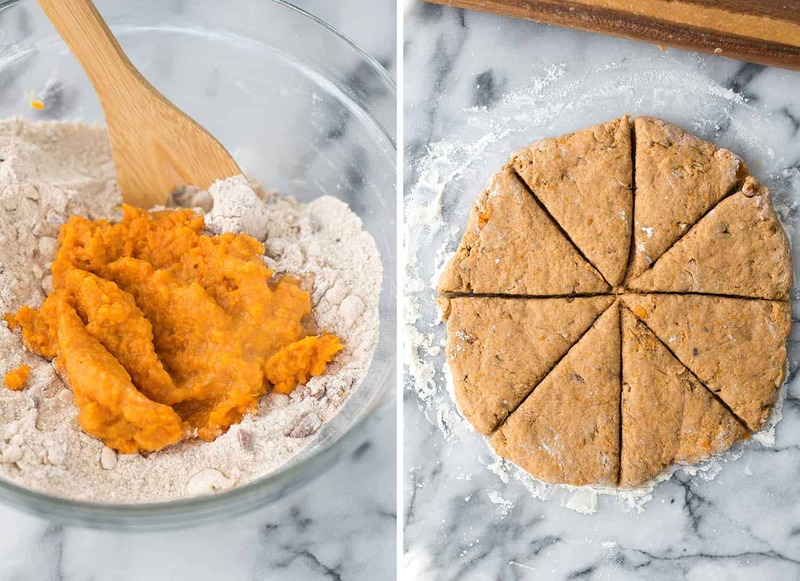 Sweet Potato Scones! Otherwise known as the best coffee pairing in the world. Since National Coffee Day is tomorrow, it’s only appropriate to share my recipe for coffee’s BFF today. After breakfast with a friend a few weeks ago, I couldn’t get their sweet potato scones out of my head. Incredibly tender with the perfect amount of crumb; after the first few bites, I immediately ordered a half-dozen more to take home with me. Of course, as soon as I was done with those, I tried to recreate them on my own terms. Story of my life. I swapped in a few fall ingredients, like nutmeg, cinnamon and cloves and topped them off with a sweet, maple drizzle and extra pecans. One of these and an oversize cup of coffee? The perfect morning. After a hectic summer, BL and I have both been trying to get back into some type of routine. Which, has been hard for me in the transition from full-time to self-employed. Some days I’m a rock-star, other days I can’t quite figure out where the day went. Since we both can be found working well into the evening, we’ve turned our mornings into us time. Most days of the week, we’ll begin with a quick run around the neighborhood. Though I hate leaving my warm-bed for an early morning jog, I know I always feel better after it’s done. It’s also a great way to get out any nerves for the day and connect with BL. After that- we know our roles. I make breakfast while he get’s ready for work. While the breakfast often changes, the coffee never does. If it’s 8AM, you will find a cup of coffee in my hand. I love it, I need it, I crave it. Coffee is my life-blood and I’m completely OK with admitting it. Folgers makes my morning routine so much easier with their perfect measures coffee. If you’ve ever thought that you can’t make coffee, this is for you. In my first job, my most important task was making coffee for everyone in the morning. Gah, I still remember calling my mom, panicked in tears, because I had no idea what I was doing. Needless to say, those first few pots were not drinkable. Unless you like your coffee the color of tea or black as tar. While I’ve since learned the perfect ratio, Folgers perfect measures makes it fool-proof. Open the container, place the disks in the filter and brew. Less time standing around the coffee machine means more time to bake up the perfect breakfast to go-with. Of course, I’m partial to these scones. I know pumpkin is all the rage right now, but sweet potato might be my favorite orange food. I’ve always got a few taters lying around, ready to be baked, stuffed or pureed into baked goods. You can find sweet potato puree in the canned vegetable aisle (or, dare I say, sub in pumpkin puree), but it’s also simple to make at home. Bake for an hour until soft, then peel and mash the flesh. Once you combine the batters together, it will look like there isn’t enough liquid, but trust that it comes together. You may need to put down the spoon and knead with your hands to incorporate it fully. The beautiful part about scones is that rustic is in. They don’t have to be perfect, so don’t stress over rolling them out or slicing them just right. Bake until tender, then drown in that maple cinnamon glaze. Yes, it’s pretty much all sugar. Not necessary, but completely delicious. 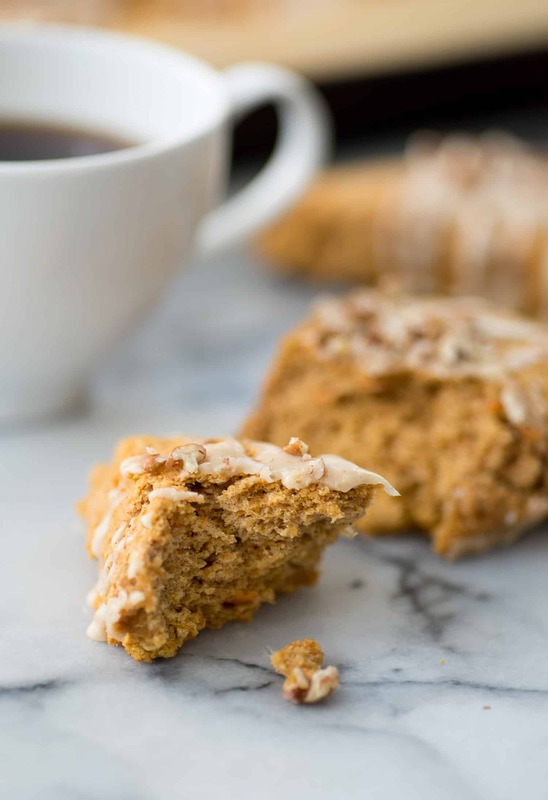 Sweet Potato Pecan Scones with Maple Frosting! You are going to love these healthy, vegan scones! Packed with sweet potato puree, whole wheat-flour and pecans. Drizzled with maple frosting and covered with more pecans. If you need to make the sweet potato puree, bake the sweet potato and scoop out the flesh. Set aside. In a large mixing bowl, whisk together the flour, brown sugar, cinnamon, ginger, nutmeg, cloves, baking powder and 1/2 cup finely chopped pecans. Using a pastry cutter, cut the butter into the flour until the butter is in tiny pieces. In a separate bowl, whisk together the sweet potato puree, milk and vanilla extract until smooth. Add the potato puree to the flour and stir together until the ingredients are completely mixed together. The mixture will be thick, and you may have to use your hands to knead the dough for it all to come together. Transfer the dough to a cutting board and form into a 1″ thick circle. Use a knife or pizza cutter to slice the circle into 8 slices. Place the slices on a lightly sprayed or parchment lined baking sheet and bake for 15 minutes until golden brown and cooked through. While the scones are baking, make the glaze. Whisk together the powdered sugar, maple syrup and cinnamon until smooth and creamy. Drizzle the glaze over the scones and sprinkle with remaining chopped pecans. *You can purchase sweet potato puree in the canned vegetable aisle or make your own by roasted 1 large sweet potato in a 400 degree F oven until very soft. Let cool and scoop out the flesh. I love scones and these look so tasty! Can’t wait to give these a try! The video turned out GREAT!. My fave shot: The pecans dropping onto those yummy looking scones….oh and the drizzle drizzling! I happened to be eating sweet potato scones the other day at a certain bakery and thought, I must recreate. Thanks for doing the ‘hard’ work for me! I would so love to make these but am dieting so do you know how many calories please. Hi Linda- there are ~310 calories per scone. You can decrease that amount by not adding the glaze. Thanks!